Didn't post these in Part 1 but we passed by the Atomic Dome on our way back to the hostel and just snapped a few pictures. More about it towards the end of this post. You can get to Miyajima by ferry and if you buy the combined tram and ferry day pass, it's value for money. We went there quite early because we wanted to spend the whole day there. We got to the ferry around 10-ish and there were quite a few people waiting already. If you drive, you can just drive your car onto the boat and it brings you across. Makes it convenient if you didn't want to walk around the whole island I guess. Giant map of Miyajima when we first got off the ferry. We were greeted by a deer! This reminded me of Nara where the whole place is overrun with deer who go after you thinking you have food and trying to steal it. I'm enjoying my head pat tyvm. As we made our way towards Itsukushima Shrine, we passed by a stall with these amazing oyster rice balls. We chose not to go into the shrine because you have to pay extra but they had an information board with the times of high tide and low tide for people to know when to come back to the area. At low tide you can walk out to where the torii gate is. We made our way up towards Momijidani park and the cable car that would bring us to the top of Mt. Misen. Along the way were lots of souvenir shops selling everything from geta to deer antlers. It was a very nice walk up towards the cable car with lots of trees and a little river flowing by. The cable car stops at Shishi iwa station where you can stroll around and then walk up to the summit of Mt Misen. They have little viewing platforms where you can look at the different islands dotted in the Seto Inland Sea. Roaring away at the ShiShiIwa which literally means Lion Rock. On our way up, we stopped at a temple and there was this little statuette with a baseball cap on it. The walk up to the summit wasn't too hard but there were parts that were a bit slippery and muddy because of the rain in the last few days. I saw a Japanese girl walking up wearing heels and was impressed with her foot skills. I probably would have tripped and sprained my ankle. Afterwards we just made our way down and came across some more deer in this bit of open space. I thought it looked pretty with the deer grazing away and the sakura in the background. Since it was around 4pm which was low tide, we went back to the torii gate and saw lots of people walking around on the sand. The people were tossing coins up and trying to get it to land on the beams so I proceeded to try it out too. I assumed it meant that I would have lots of good luck or prosperity or something. It was a lot harder than it looked because the coin kept rolling off and falling back but I finally succeeded! Win! While we walked around, we saw lots of old people on the beach collecting something. Curious, we went up to one of them and asked what they were doing. This man told us that they were collecting asari clams for miso soup! They're all locals living on the island and I thought it was cute that they all just go out to collect clams. I think they do it almost everyday. Mmmm, clam miso soup! Noms! Walking down the Miyajima shopping street we found some jizo statues. Cute! And also the world's biggest rice paddle. 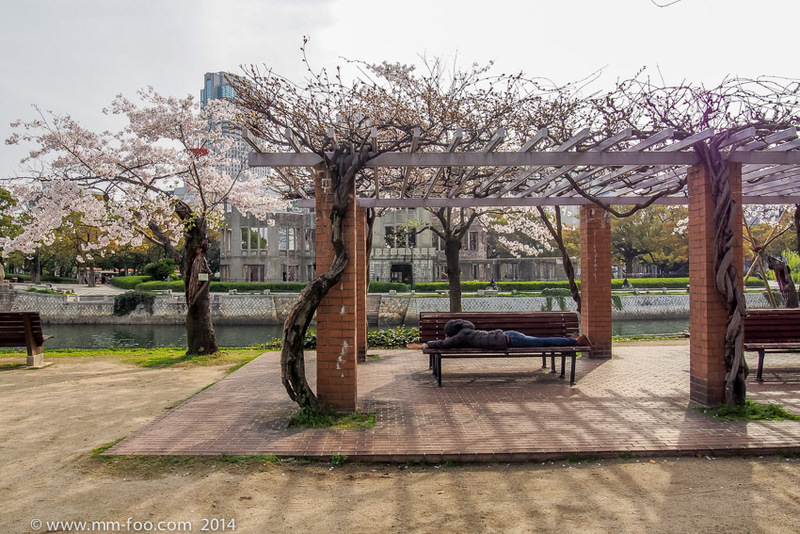 On Day 5, we had booked to take the Willer Express bus back to Kyoto but we hadn't visited the Peace Museum yet so we decided to wake up early to go. And we started the journey with the Atomic Dome. Before getting to the Peace Bell that MF gong-ed. Getting to the Children's Peace monument that had lots of origami paper cranes. You can see the colourful paper cranes in the shelves behind the monument. I'm not sure if there were a 1000 for every batch that were hung up but folding 1000 origami cranes is Japanese tradition. 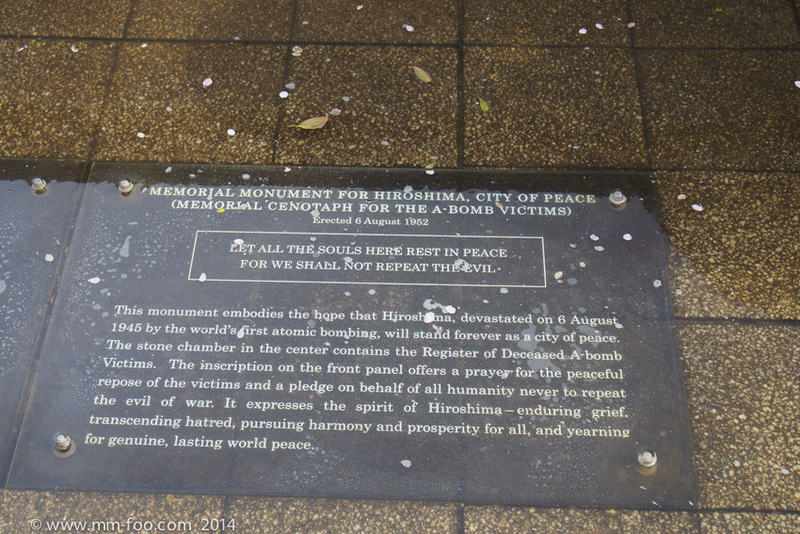 All of these monuments are in the Peace Park which is a huge area near the river and the Atomic Dome. 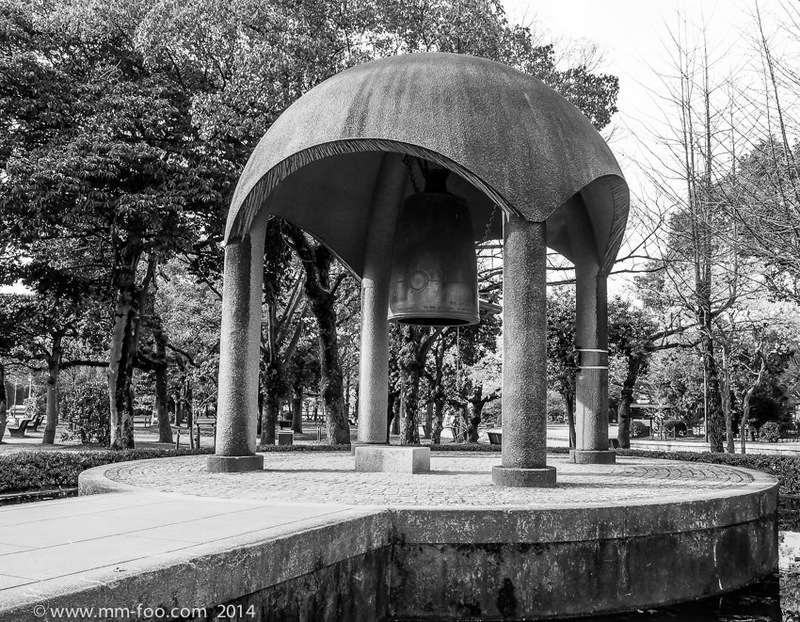 We started from the Atomic Dome and walked towards the end of the park where the Museum was. They built the Museum and the Light of Peace (the flame that's in the photo above) so that they are all in line with the Atomic Dome. 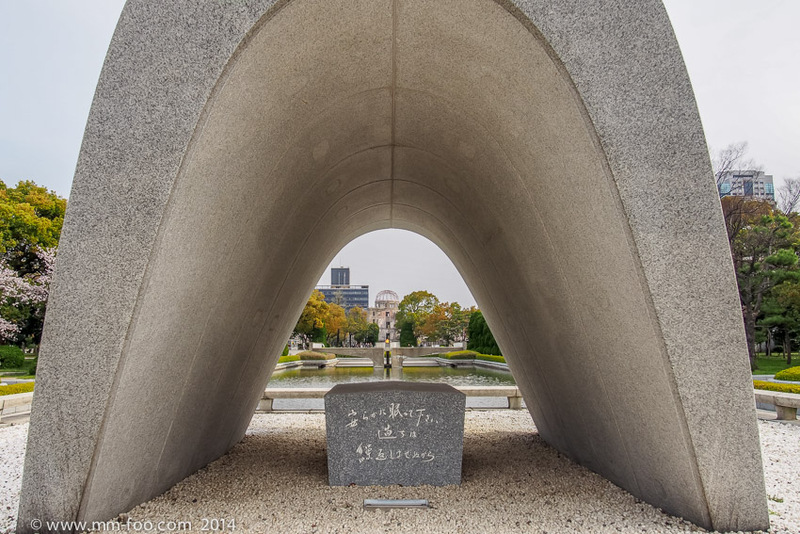 You can see in the photo below the Atomic Dome through the Memorial Monument. By the end, we were really rushing to see everything in the Museum because we had to go back to the hostel and pick up our bags before heading to the train station where the bus stop was. We cut it really close but managed to catch our bus. The Museum was interesting with lots of relics, videos and preserved bits of buildings. Obviously sad and depressing but enlightening. I would have loved to spend a bit more time to read more of the stuff at a leisurely pace instead of rushing but we still managed to fit it in so all good.